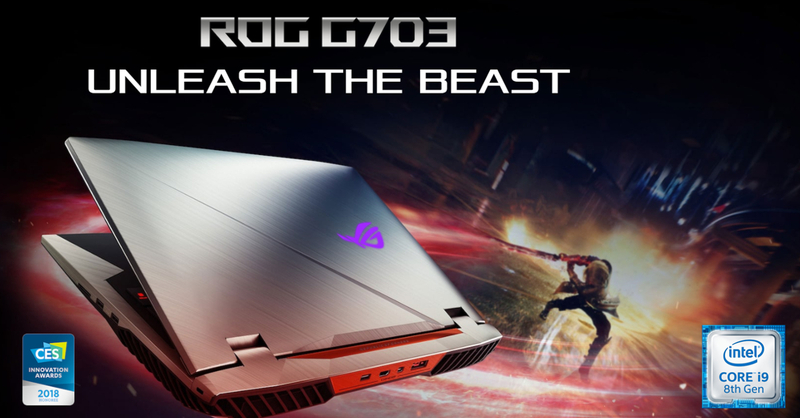 Home Tech ROG unleashes the BEASTLY Core i9-powered Chimera G703 gaming laptop! Will ASUS accept my kidneys as payment? Pack it up folks, ASUS just announced the availability of the top-end ROG Chimera G703 gaming laptop! The Chimera G703 is ASUS’ most powerful gaming laptop to date, as it packs up to an all-new Intel Core i9 processor that’s complemented by an NVIDIA GeForce GTX1080 GPU. If that’s not enough, you’d be happy to know that the Chimera features a 17.3-inch Full HD 144Hz IPS display. The Chimera also comes with ASUS’ bio-armor design with quad-vents for extra cooling power — which allows the Chimera to be overclocked! For storage and memory, the ROG Chimera G703 can be configured with up to 64GB of ram, 2TB of HDD, 512GB of PCIEx4 NVME SSD. With this amount of storage and memory, you’ll be able to store and play literally every game in your Steam library; and in over 60 FPS too thanks to the Core i9 CPU and GTX 1080 GPU. If you’re itching for a gaming laptop with no compromises and can play all your AAA games at max settings, the ROG Chimera G703 might be the laptop for you! Be warned though, it costs a jaw-dropping PHP 229,995 for the 32 GB RAM/1TB HDD version. The 64GB RAM/2TB HDD version meanwhile, costs a whopping PHP 249,995. The ROG G703 Chimera is now officially available in the ROG Concept Store at SM Megamall and in the ROG Concept Store at SM City Cebu.